When cells are subjected to environmental stress, they respond by enhancing expression of HSPs. The rapid induction of HSP in response to environmental stress is based on a variety of genetic and biochemical processes referred to as the heat shock response (HSR) 145. HSR is preferentially regulated at the transcription level by heat shock factors (HSF). 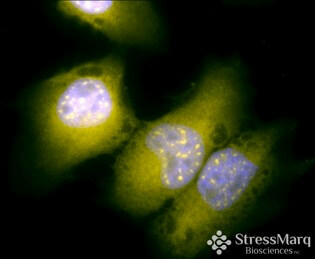 Among them, HSF-1 is considered as being the key transcription factor of stress-inducible HSPs 146. 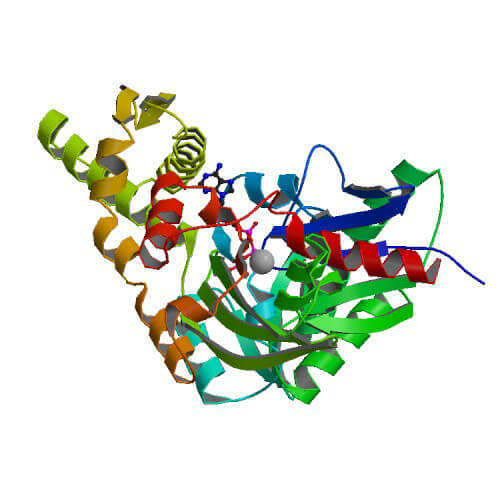 Under normal conditions, HSF-1 exists as an inactive monomer in the cytosol in conjunction with further chaperones such as Hsp70 and Hsp90 147. Exposure to stress induces the release of Hsp70 and Hsp90 proteins fom the complex with subsequent formation of HSF-1 homotrimers capable of binding to heat shock elements (HSEs) upstream of HSP promoters, thereby triggering HSPA gene transcription 148, 149. Grp78/BiP is encoded by the single-copy nuclear gene HSPA5 which is not inducible by heat shock since the corresponding promoter lacks the heat shock element 130. As outlined before, the expression of Grp78/BiP in adult tissues is usually low under non-stress conditions but increased considerably under stressful conditions controlling proteostasis and calcium homeostasis in the ER. Grp78/BiP was originally identified in the late 1970s in connection with further chaperones as intracellular polypeptide induced by glucose deprivation 21-23. Several studies during the following years revealed the inducibility of the HSPA5 gene in response to further environmental stressors (reviewed by Catie Casas, 2017) 130. Nowadays it became obvious that the stress-induced Grp78/BiP up-regulation is facilitated by highly conserved regulatory domains and protein-binding sites within the promoter of the HSPA5 gene, including e.g. the ER stress response element (ERSE) 150, cAMP response element binding protein (CREB) 151, as well as the CCAAT box 150. These promoter elements function as binding sites for numereous transcription factors (Figure 4) that regulate HSPA5 gene transcription. 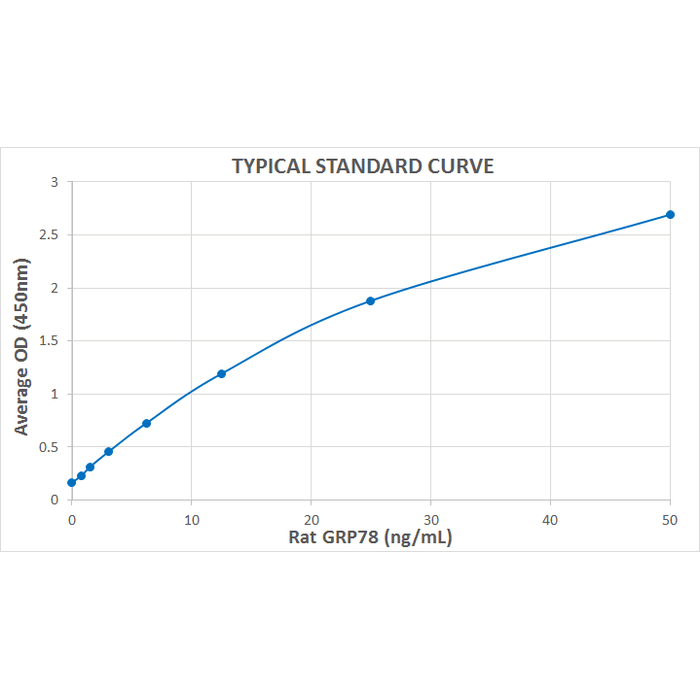 Apart from its transcriptional regulation, Grp78/BiP protein levels have also been found as being regulated at the post-transcriptional level. In this context, the discovery of micro-RNA (miRNA) identified this RNA subtype as a crucial player in regulating translation of many genes. miRNAs are a class of small non-coding RNAs that negatively regulate gene expression by binding to target mRNAs. Global alterations in miRNAs can be observed in a number of disease states including cancer 152-154. Several investigations identified specific miRNAs that bind to the 3’-untranslated region in the HSPA5 mRNA, including miR-124 155, miR‑199a‑5p 156, miR-181 157, miR-181a 158, miR-181b 159, miR-376a 160, as well as miR-30a 161 and miR-30a-5p 162. Further post-transcriptional regulatory mechanisms include the activation of the internal ribosome entry sequence (IRES) in the 5′-untranslated region of the HSPA5 mRNA 163, crucially involved in the selective translation of the HSPA5 mRNA 164. Moreover, the activation of the PI3K/AKT pathway in response to ER stress has been found by Dai and colleagues to enhance Grp78/BiP protein stability by a currently unknown mechanism 165. It has been shown previously that several inflammatory mediators and signaling molecules such as NF-κB and TNF are strictly bound to chaperone / HSP gene expression and protein functions. In this respect, the NF-κB subunit p65/RelA acts as a transcription factor for numerous HSPs 166-168. It should be mentioned here, that combined treatment of leukemic cells with the proteasome inhibitor bortezomib and the casein kinase-2 inhibitor CX-4945 down-regulated Grp78/BiP expression and blocked NF-κB signaling 169, indicative for an NF-κB-dependent regulation of the Grp78/BiP expression. The activity of Grp78/BiP is regulated by several co- and post-translational modifications. Similar to many other chaperones, Grp78/BiP is a phosphoprotein 41 whose expression and function can be further modulated by methylation 42, 43, AMPylation 44, acetylation 45, O-glycosylation 46, ADP-ribosylation 47 and SUMOylation 48. To what extend phosphorylation especially affects the molecular or biological functions of the chaperone is still unclear. 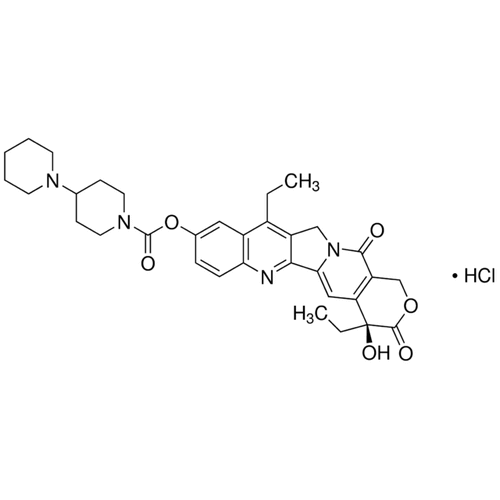 Among the numerous post-translational modifications AMPylation should be highlighted. The group of Seema Mattoo discovered AMPylation of Grp78/BiP as a crucial regulator of signal transduction during UPR which is catalyzed by the ER-resident Fic (filamentation induced by cAMP) protein HYPE (Huntingtin yeast interacting protein E) 44. HYPE has been identified to adenylate Grp78/BiP at Ser365 and Thr366 and consequently to boost the ATPase activity of the chaperone, mandatory for refolding of misfolded polypeptides during ER stress 44.